What happens when three neighborhood friends have an argument over who makes the best chili? Challenge each other to a chili cook-off! Which is exactly what happened between Andy Adams, Matt Carabetta, and Doug Thurston last year. They invited other residents to join in to compete and vote on who does in fact make the better chili. The turn out was so successful that this year the founders decided to compete for a cause. 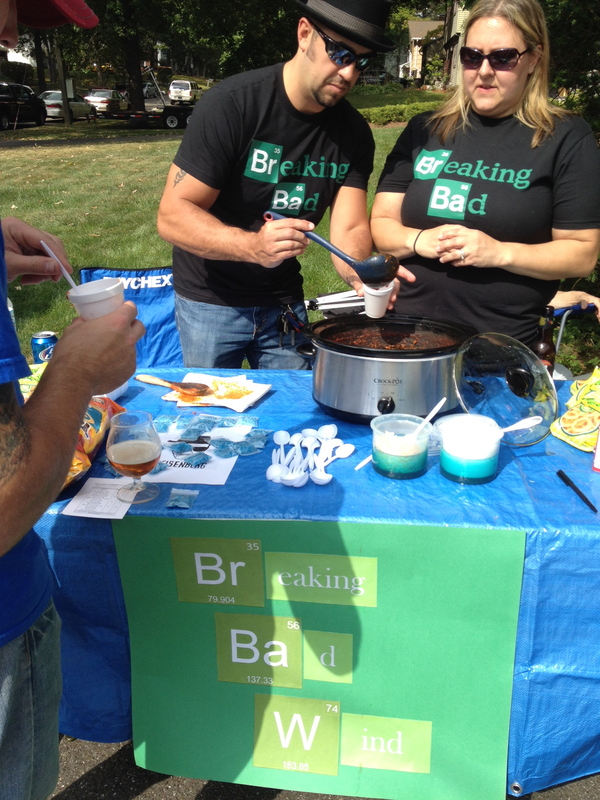 The 2nd Annual Mayflower Chili Cook-off was held on the corner of Mayflower Lane and Morely Avenue in Meriden, Connecticut. 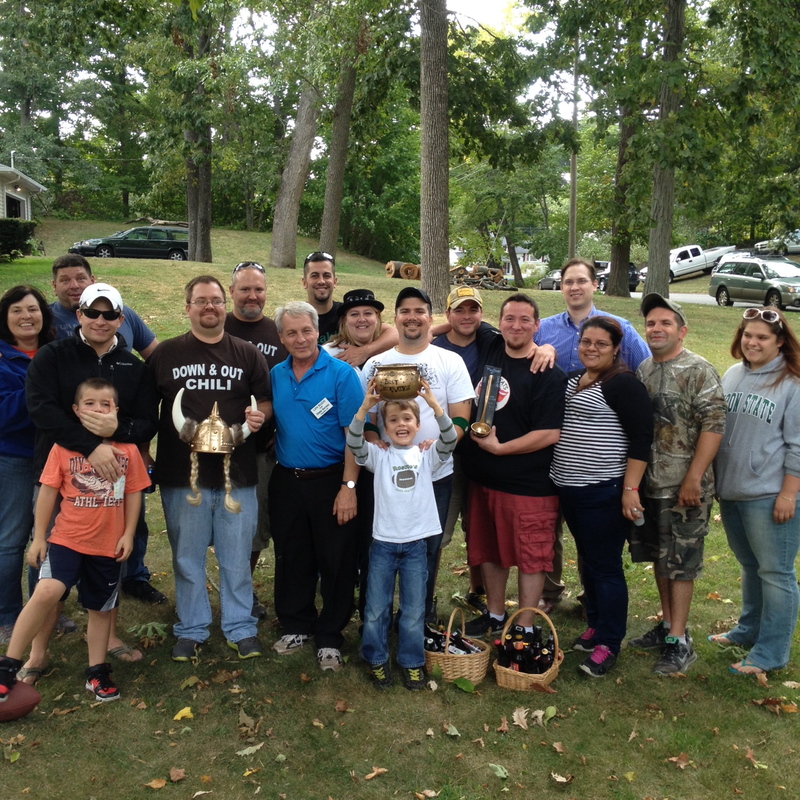 Competitors and guests were encouraged to bring donations to support the Meriden Soup Kitchen. 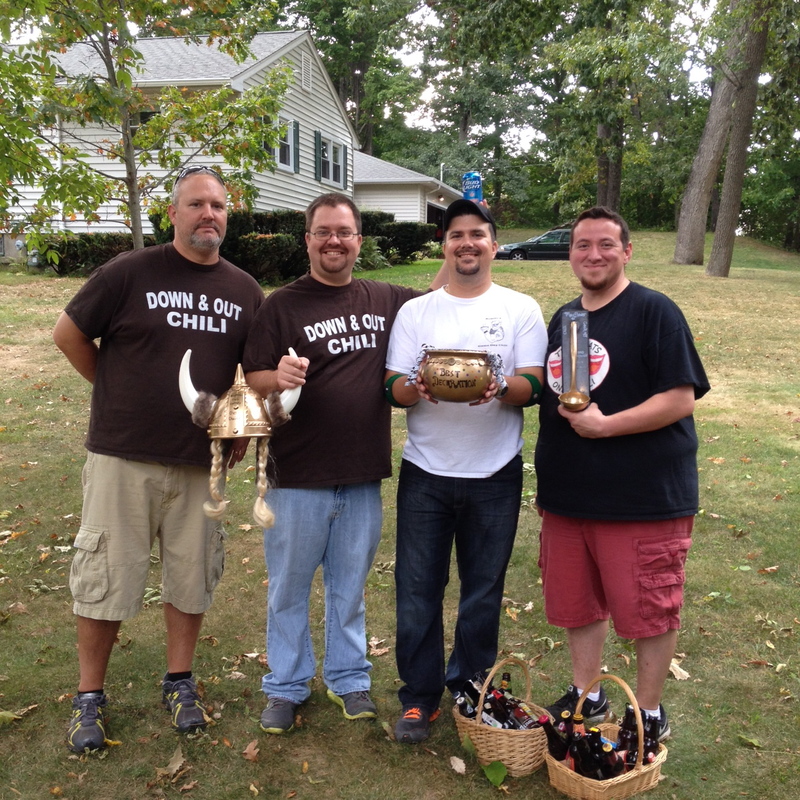 Fifteen teams participated presenting their chili and brought along their favorite craft beers to share. 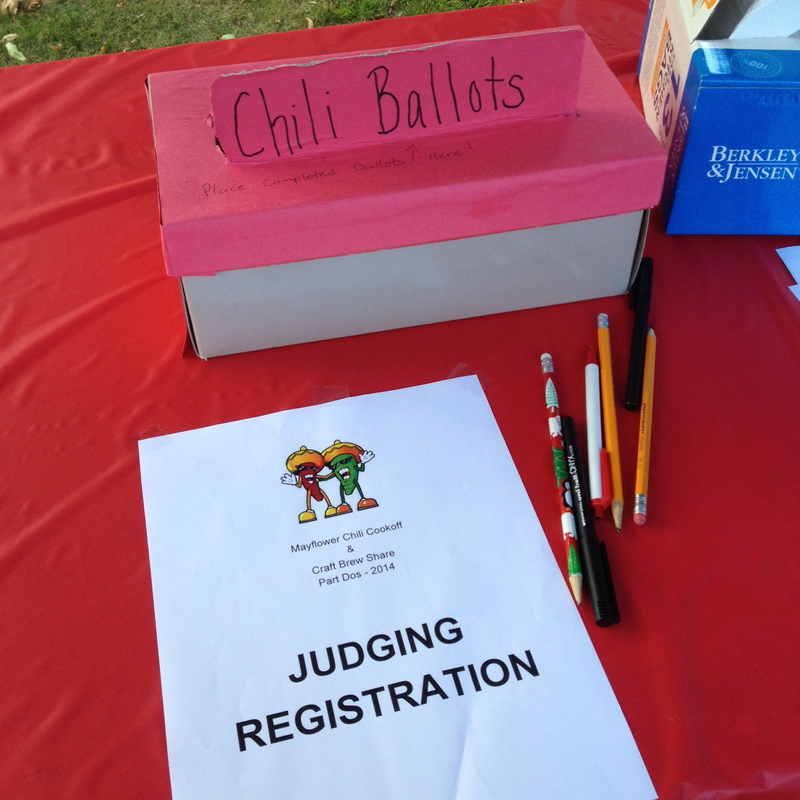 Score cards were available for each guest to vote on a scale of 1 to 5 for best chili and best table decor. The competitors vote for “Chef’s Choice” and the mayor of Meriden, Manny Santos, comes down to vote for his personal favorite. I was very excited to hear from Andy Adams regarding this event. I worked with Andy, along with Matt Carabetta, years ago at Lowe’s Home Improvement. Andy and I share a great love for food, and when he asked me to compete, I was hesitant. Since I wouldn’t call myself an expert in making chili at all, I declined. But, I gladly accepted the invite to come eat! On Saturday, September 20th, I grabbed my donation bag and headed to the cook-off. As soon as I arrived Aimee, Andy’s wife, handed me a margarita. I said hello to old friends and scoped out the scene. I chuckled at some of the team names on the score card: Breaking Bad Wind, Game of Porcelain Thrones, Smokin’ Bowls, Fire in the Hole. It is a chili competition after all, right? Chili For An Occasion – Chili made with slow braised short ribs, super tender. Not hot, just delicious. Highly recommended with sour cream. I really could eat this chili at any occasion. Kudos on the name. 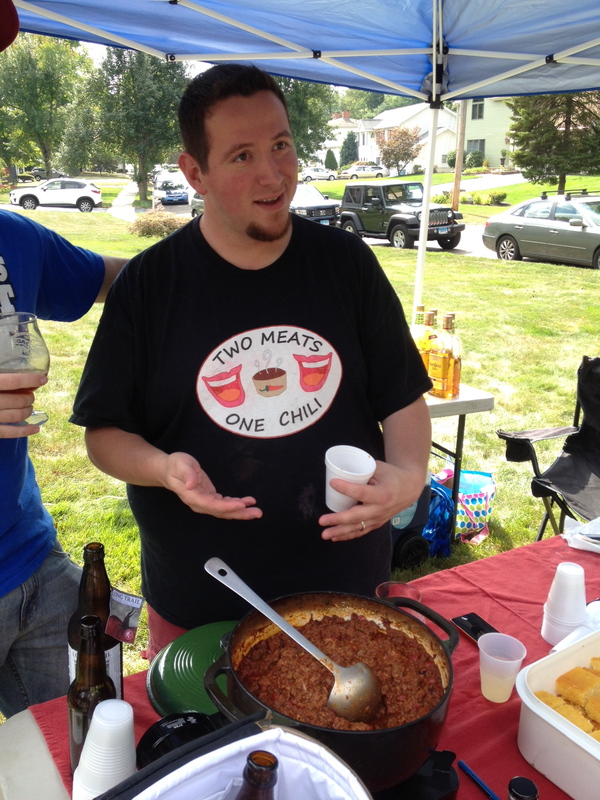 2 Meats, 1 Chili – Texas chili, no beans allowed! All the meats were smoked first, then the chili itself was smoked. A delightful smokey flavor and not overpowering at all. I would say the best prepared meat of all the chilis. Morning Revenge – This was hot! Not for the faint of heart. It was best to taste this one last because the ghost pepper could take over your taste buds. I thought the flavor of this chili was very enjoyable. It was served over crumbled saltine crackers and cheddar cheese, and when mixed together it mellowed the heat. Chocolate Love Chili – Chili for a nice cold day. The flavors were well-rounded and not too spicy. The complimentary gluten-free brownie cookies were a nice touch. I was definitely feeling the love. 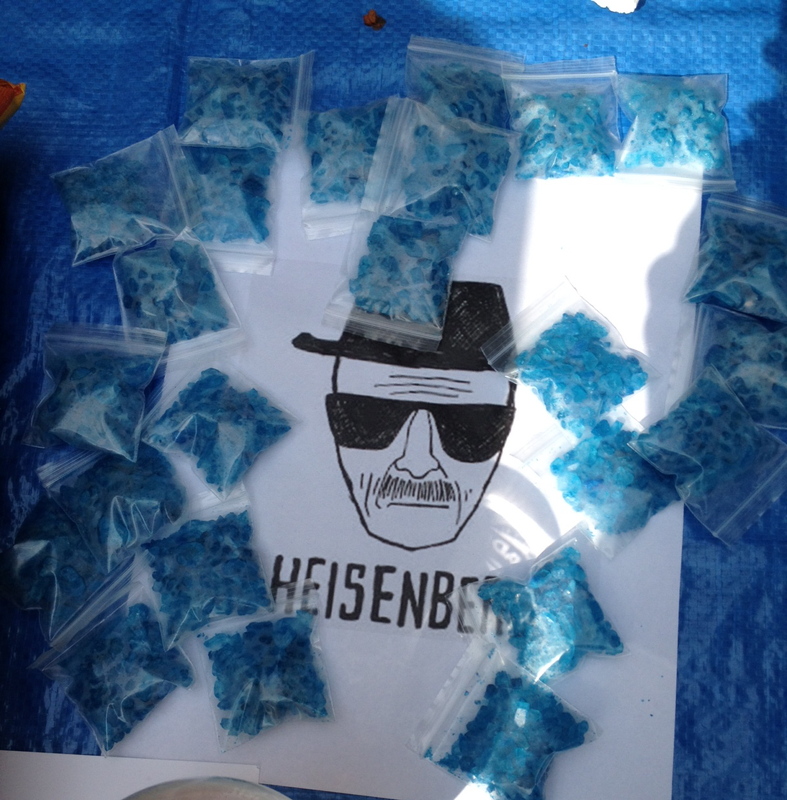 Breaking Bad Wind – offering complimentary “meth” (blue raspberry rock candy). 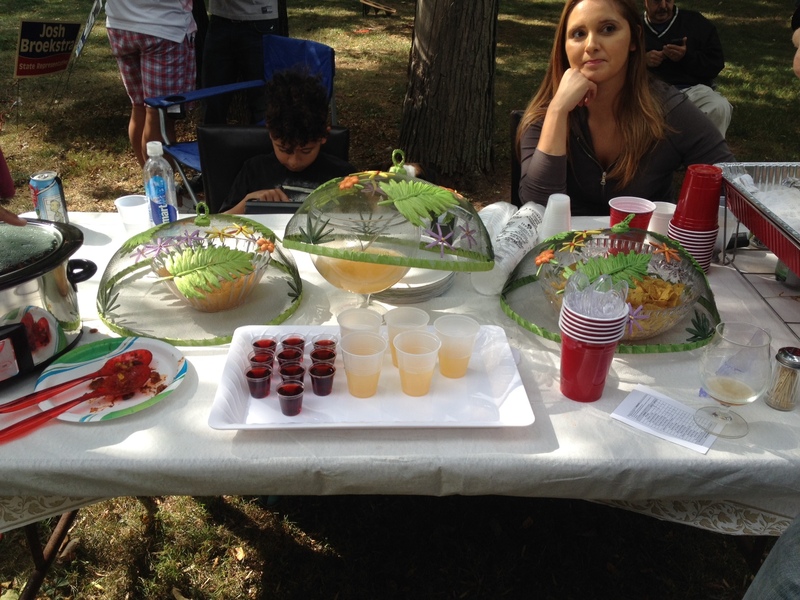 Team Work – A very pretty table with Guinness jello shots and refreshing tropical punch to pair with their steak and corn chili. 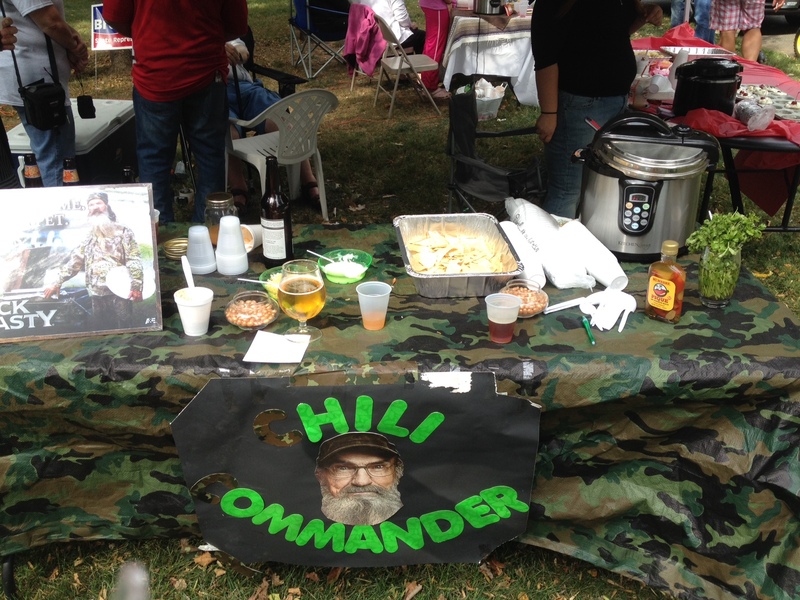 Chili Commander – In full camouflage presenting their smokey duck chili served with homemade apple pie moonshine. The score cards had to be submitted by 4:30 PM and winners were announced at the end of the event. Overall, this was an outstanding event. Beautiful weather, great people, delicious food, and generous hearts. 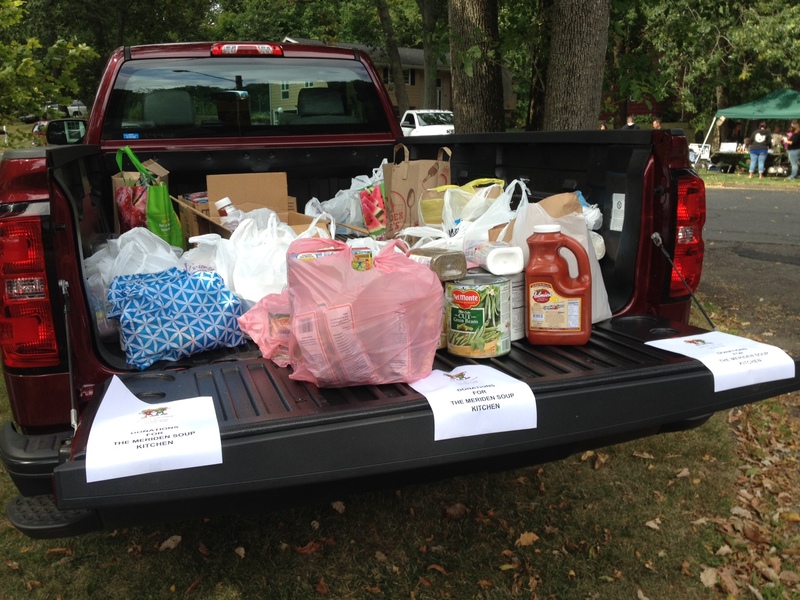 The pickup truck holding the donations was filled to the max. It was so nice to see a neighborhood come together to support this cause and have fun while doing so. A big thank you to all who participated in this day and allowing me be a part of it! The hope is that this event will reach more of the community and get bigger in the future. If you are interesting in participating in the chili cook-off or would like any information for future events, please feel free to contact Andy, Matt or Doug by email at mayflowerchilicookoff@gmail.com. Awesome Job Tammy!! 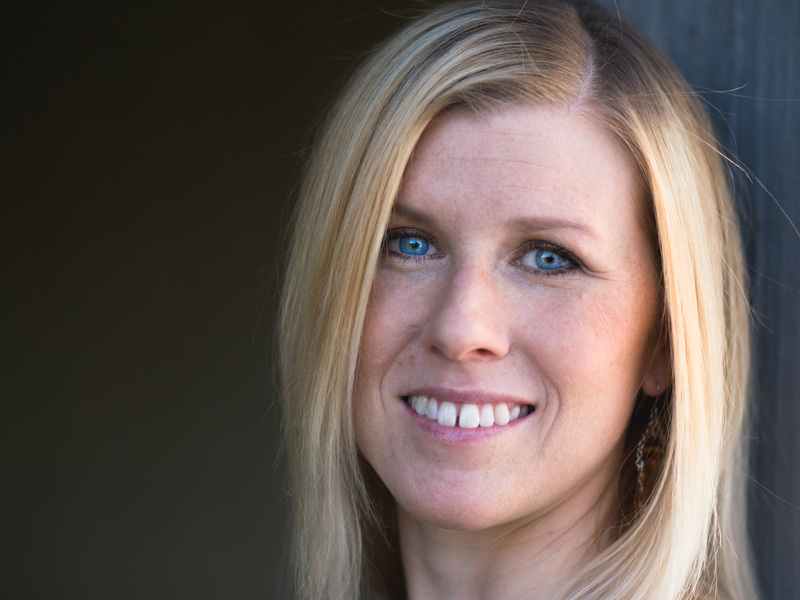 Thank you so very much for this generous post on your blog. Truly appreciate it. You’re the best!